Home Streaming Roku 2017 Roku Model Comparison Table – Which Roku Should I Buy? If you are thinking about cutting your cable cord but still need to be able to watch movies and TV shows, then you are likely in the market for a way to do that. There are a number of great, affordable devices that can meet your needs, but one of the options that is likely to keep coming up in your research is the Roku. However, Roku is the name of a company, and not a singular product. At the time this article was written, Roku currently sells six different models of devices, each of which includes a feature set that is meant to appeal to a specific type of customer. There are options for a budget, for people that need to connect the device to a TV that doesn’t have an HDMI port, mid-level devices that don’t have all of the features, but offer the perfect mix of power and affordability, and a high-end device that includes every feature that a Roku device can currently offer. The chart below provides a convenient way to visually compare each model and see which one is right for you. Below the chart we expand further with additional information on each device. 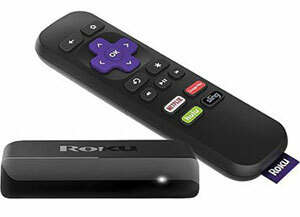 The Roku products are part of a class of electronic devices called “set-top streaming boxes.” You connect them to your TV with an HDMI cable (or RCA cable, in certain cases), then you connect the Roku to your home network to start streaming video. The Roku itself does not have a monthly or yearly fee, although many of the services that you use on the Roku will charge their own subscription fees. This includes services like Netflix, Hulu, HBO Now, Amazon Prime, etc. The Roku has “channels” for all of these services. You simply install the channel that you want, enter your account information, then you can browse and watch content from those channels on your TV. The appeal of the Roku over other comparable products, such as the Apple TV, Chromecast, Amazon Fire TV Stick and other similar devices is its ease of use, and its massive channel library. There are hundreds of streaming channels on the Roku, and you will be able to use combinations of those channels to watch nearly any type of programming that you would want. The chart at the beginning of this article addresses all of the features that are present on each individual Roku model but, if you are new to this sort of product, you might still be a little confused about which Roku is right for you. We go into a little more depth below by addressing the main draw of each of the individual Roku models so you can better determine which one to get. This is the entry-level Roku device, and is the cheapest one that they sell. If you are working with a small budget and don’t have any specific feature needs, then this is likely the correct choice for you. The Roku Express offers full access to the Roku channel lineup, it streams in high definition, and is fast enough that you won’t constantly be waiting for channels to load, or for videos to start streaming. Noticeably absent from this model is the ability to stream in 4K, RCA connection, a USB port, an ethernet port, and a digital audio port. It is also the only Roku model that does not have a quad core processor, which means this is definitely the slowest model Roku that you can purchase. Click here to read reviews of the Roku Express, or to purchase it from Amazon. The Roku Express + is very similar to the Roku Express, except for one noticeable difference. The Roku Express + includes RCA cable compatibility, which means that you can connect it to an older TV that does not have an HDMI port. That connection would otherwise only be possible with the use of an HDMI converter, like this one. The Roku Express + is also slightly more expensive than the base Roku Express, so this option is really only suited for individuals that need to connect their Roku to a TV that does not have an HDMI port. But it does offer the benefit of including the HDMI connection as well, so you will be able to continue using the Roku Express + later if you decide to upgrade your TV to a newer model with an HDMI port. Click here to read reviews of the Roku Express +, or to purchase it from Amazon. The Roku Streaming Stick is the least-expensive Roku model that includes their quad-core processor. This means that the streaming stick is faster than the Roku Express. While the Express is certainly not slow, the streaming stick is noticeably faster. The Roku Streaming Stick is also the most portable of the Roku models. You can easily disconnect it from one TV in your household and move it to another one. You can also fit it into a bag or suitcase with ease so that you can connect it to a TV in a hotel room, at a friend’s house, or even to a monitor or TV at work, if necessary. Additionally, depending upon how your TV is set up in your home, you may not have a place to put a set-top box. The streaming stick can fill this role easily, as it just connects to the HDMI port. I have one connected to a TV that is mounted on my wall, meaning that I don’t need to worry about any unsightly wires. The Roku streaming stick can also pull power from a USB port on your TV, so you can connect it to that and forego the need to plug it into an electrical outlet. Click here to read reviews of the Roku Streaming Stick, or to purchase it from Amazon. The Roku Premiere is the least-expensive of the Roku models that can stream 4K content. If you have a 4K TV and access to 4K content, then this (and any of the higher-end Rokus) is the option that you want to consider. 4K content is gaining momentum, and is likely to be the new standard in a few years. Purchasing one of the Roku options that can handle 4K will make your purchase a little more future-proof, plus it allows you to use the full capabilities of your 4K TV. But this is the lowest-level model of Roku that supports 4K, so it is still missing some key features that might be important to you. For example, it does not have an ethernet port, a USB port, or a MicroSD slot. Click here to read reviews of the Roku Premiere, or to purchase it from Amazon. The Roku Premiere + shares many of the characteristics of the Roku Premiere, except for a few key upgrades. The Premiere + also supports HDR, and includes an ethernet port and a MicroSD slot. So if you have content on a memory card that you would like to be able to watch via the Roku, then this is the model that will allow you to do that. Additionally, the inclusion of the ethernet port provides you with the ability to use the Roku in an environment that does not have a Wi-Fi network. You may also find that the performance and streaming speeds are better over ethernet, depending upon the configuration of your network and the distance from the router. The Premiere + is missing some of the features that are available on the top-of-the-line Ultra, including a USB port, optical digital audio port, enhanced remote control features, and Dolby Audio decode via HDMI. Click here to read reviews of the Roku Premiere +, or to purchase it from Amazon. This is the very best that Roku has to offer, and is their premium model. It’s fast and fully-capable. If you have specific media needs, such as a home theater in which you would like to incorporate your set-top streaming box, then this is the option for you. Aside from the digital audio capabilities, however, I think the USB port is one of the best features. If you have movies or other media files on a flash drive or an external hard drive, then you can connect that to the Roku via the USB port to watch that content. The Roku Ultra is the right choice for you if you want something that is fast, powerful, and able to do just about anything that you might want from a set-top streaming box. That functionality comes at a cost though, as this is the most expensive Roku model that is offered. However, with a MSRP of $129.99, even their most expensive model is still rather affordable. Click here to read reviews of the Roku Ultra, or to purchase it from Amazon. Question 1 – Which Roku should I buy if my TV doesn’t have an HDMI port? Answer 1 – If your television does not have an HDMI cable, then the only Roku model that will work is the Roku Express +. You can use RCA cables (the red, yellow, and white ones) to connect the Roku Express + to your TV. Question 2 – Which Roku should I get if I don’t want to spend a lot of money? Answer 2 – The least expensive Roku model is the Roku Express. It doesn’t have all of the bells and whistles of the higher end models, but it is pretty fast, and will let you stream video in high definition. Question 3 – Which Roku should I buy if I don’t have a 4K TV, but I’m planning to get one soon? Answer 3 – Several of the Roku models are 4K capable, and they will all still work with 1080p TVs as well. If you don’t have any specific requirements and are just looking for the least expensive Roku model that can stream in 4K, then that model would be the Roku Premiere. Question 4 – Do I need to pay a yearly or monthly subscription if I get a Roku? Answer 4 – No, the Roku itself does not require any monthly or yearly fees. However, certain channels will require a subscription for you to use them, such as Netflix, Hulu, and some of the other popular subscription video-streaming services. Question 5 – Which Roku should I get if I want to connect a USB flash drive or hard drive with videos on it? Answer 5 – The only Roku model that has a USB port that would allow this type of connection is the Roku Ultra. However, you could also use a service like Plex to stream videos from a computer on your network to the Roku. Question 6 – Which Roku should I get if I don’t have WiFi in my house? Answer 6 – You will need to purchase either the Roku Premiere + or the Roku Ultra, as those are the only two models that have ethernet ports. Question 7 – Does the Roku come with an HDMI cable? Answer 7 – No, it does not include an HDMI cable. if you order one from Amazon, though, you can just add on an HDMI cable for a few dollars. This is one that is inexpensive and works well. Question 8 – Which Roku should I get if I have a wall mounted TV that is not close to a power outlet? Answer 8 – This is the perfect situation for one of the Roku Streaming Sticks, as they can also connect to the USB port on your TV to draw power, which means that you won’t need to connect to a power outlet. Definitely check your TV model, however, and confirm that it can power devices through its USB port before you commit to this solution. Question 9 – Which Roku should I get if I have a home theater that requires an optical digital audio out connection? Answer 9 – The only Roku model with an optical digital audio out connection is the Roku Ultra. Question 10 – Which Roku would you recommend to someone that doesn’t know which one they want, or which one to get? Answer 10 – My personal recommendation is always the Roku Premiere. It gives you almost all of the features that a Roku can offer, and it costs less than $100. I feel like $100 is the critical price point for a device like this, which makes anything over that price feel too expensive. The Roku Premiere is fast, compatible with the next generation of TVs, and can generally do everything that someone who wants a device like this could want. If you haven’t made up your mind about which set-top streaming device you want, then read our Amazon Fire Tv Stick FAQ. That is another terrific, affordable option for this type of the device, and our FAQ can answer many of the questions that you might have about it.